Update: So far, my experience with Windows 10 has been fairly positive, but I still feel more comfortable using my Windows 8.1 “official” installation for my real work. Therefore, I thought it might be a good idea to post instruction on how to backup the recovery partition, just in case the partitioning causes issues. Here’s how to do so for the Surface Pro 3, you might want to look up instructions if you’re working with a different system. Doing this ensures that you’ll be able to return to the factory default if you run into any issues. 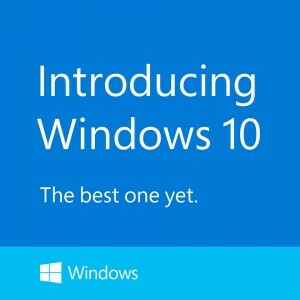 I’m excited about the direction Microsoft is taking with Windows 10 (and am already growing comfortable with the odd naming convention), and am installing and working with it so that I can keep up-to-date on its progress. As of now, the preview is aimed at desktop machines, specifically those with a keyboard and mouse, and so it’s not yet optimized for tablets and hybrid devices like the Surface Pro 3. 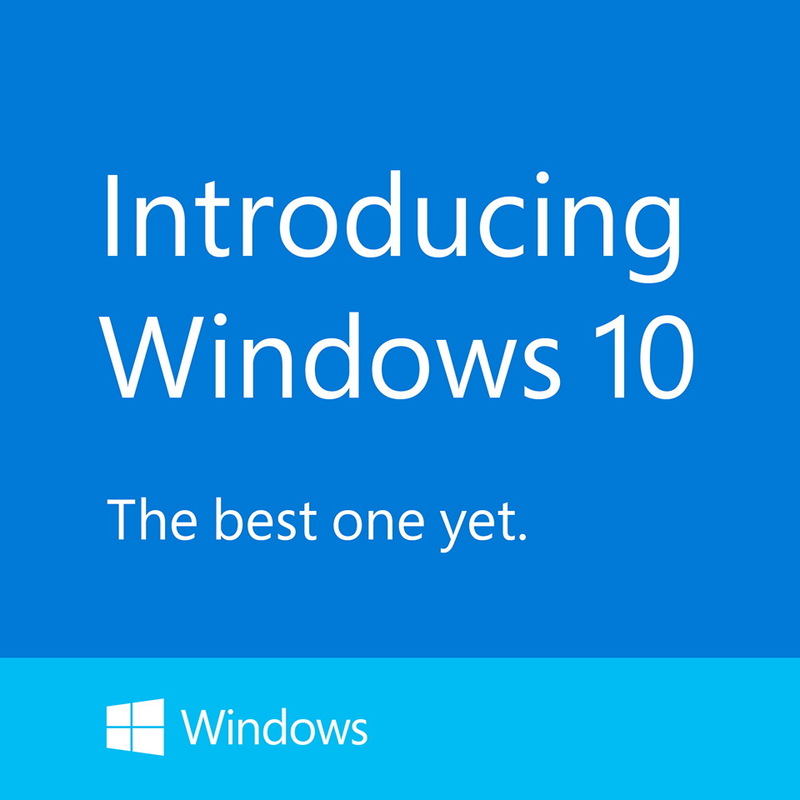 Nevertheless, I’m interested in following along as Microsoft adopts the OS for these devices. Installing the Windows 10 preview on the Surface Pro 3 was a little less straightforward than on my desktop, however, for a few reasons. I thought I’d provide an overview of the issues and how the address them, to help anyone else who might be running into the issues themselves. My process was complicated a bit because I wanted to perform a clean install to a new partition rather than upgrading my default Surface Pro 3. This way, I could dual boot the machine and retain access to the official (and supported) Windows 8.1 configuration. UEFI vs. BIOS: The Surface Pro 3 uses UEFI to boot instead of BIOS, which only matters because whereas a machine with a BIOS could boot from a USB drive formatted as NTFS, UEFI devices cannot. They require a USB drive formatted as FAT32. If you’re like me, then you’ve used Microsoft Windows 7 USB DVD Download Tool to create boot disks (and for more than just Windows 7). In the past, this has worked fine for me, but it turns out that the tool formats USB drives as NTFS and so won’t work to install to the Surface Pro 3 (or any other UEFI machine). The Surface Pro 3 doesn’t have a DVD drive, of course, and so USB remains the best option. The solution was pretty simple–create the boot drive manually. What I did was simply format my USB drive as FAT32, then copy the files from the Windows 10 Preview ISO file to the USB drive. Then, I used the method of holding the volume down button, pressing and releasing the power button, and then releasing volume down when the Surface logo appeared. The machine booted to the installation routine, and things were straightforward from then on. The biggest issue I ran into when I first attempted the installation was that a variety of Surface Pro 3 components, such as the WiFi adapter, weren’t supported by the standard Windows 10 installation. Fortunately, Microsoft provides an up-to-date set of drivers. Click on the Download button, select the file “Surface Pro 3 – September 2014.zip,” then click Next. Download them and unzip to the USB boot drive, and you can then select the uninstalled devices in Device Manager, update the drivers, and point to the Surface Pro 3 driver folder on the USB drive to install them. Do that for each uninstalled device, reboot, and everything should be supported. Microsoft provides a utility to manage partitions, called Disk Management, that you access by going to Control Panel > Administrative Tools > Computer Management > Disk Management. 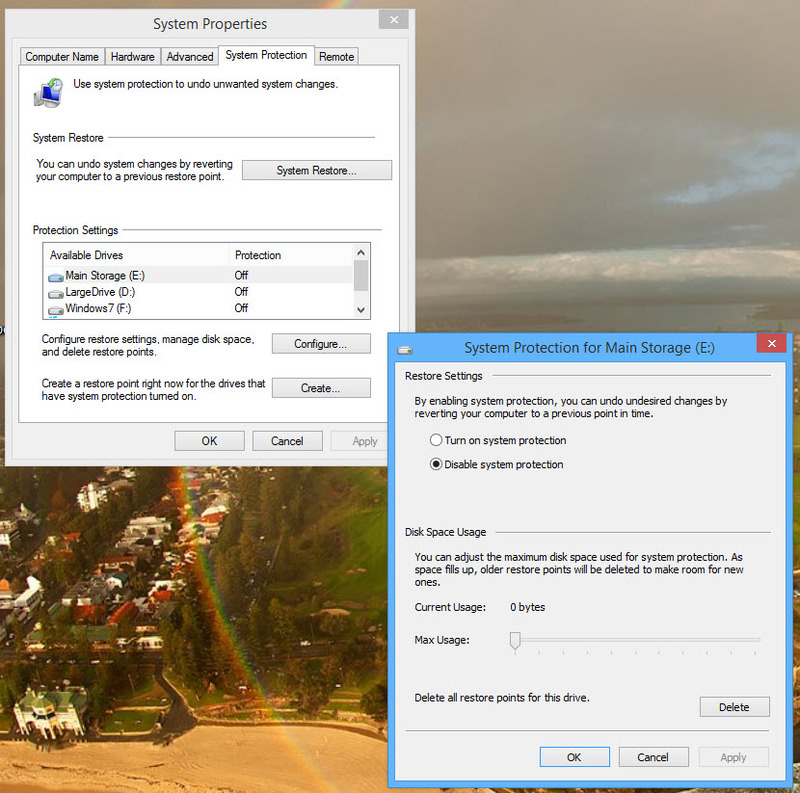 Right-clicking on a partition and selecting “Shrink Volume” allows the creation of free space and the creation of new partitions. On a hard drive, that is, one with a spinning disk, the utility will defragment the drive and move any files at the end of the drive, allowing the volume to be resized. However, on a machine with a solid state disk or SSD, like the Surface Pro 3, the system won’t perform a defrag, and certain system files like virtual memory and restore points can be scattered throughout the drive. This means that the Shrink Volume utility can’t do its job. Turn off virtual memory: Right-click on the Start button, select System, then Advanced System Settings, then Advanced. 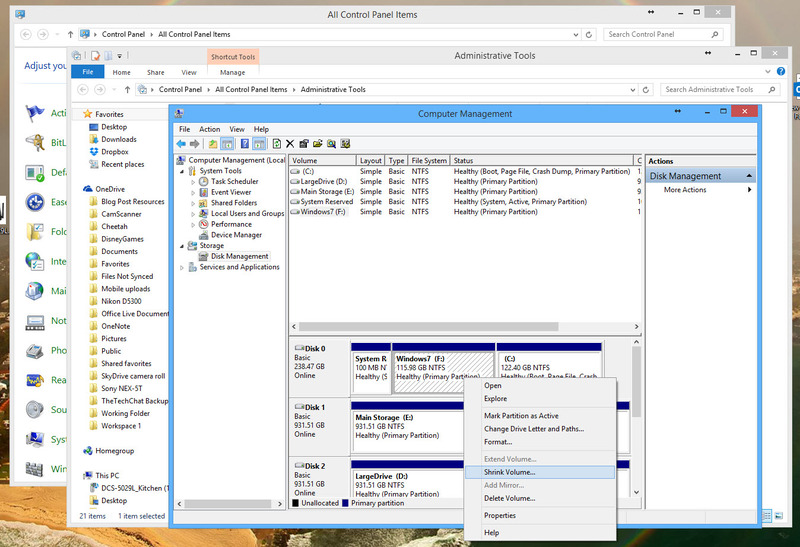 Under Performance Options, select Advanced, Change virtual memory. Uncheck “Automatically manage paging file size for all drives, and select “No paging file.” Click OK to close out each dialog. Turn off System Restore: Search “restore point,” select “Create restore point.” This opens an expanded System Properties dialog with the System Protection tab selected. Click “Configure” then “Disable system protection.” Click OK and close the System Properties dialog. Reboot the system, and then run the Disk Management utility again and shrink the volume. You should be presented with an option to shrink by some amount; for me, it was roughly 74GB, which was enough for me. 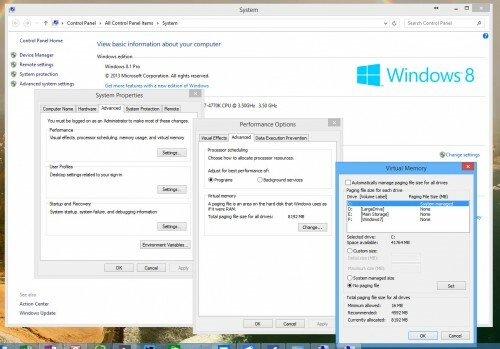 Once the volume has been resized, you can turn virtual memory and system restore back on, and proceed with the installation. Once I successfully create the partition and rebooted using the FAT32-formatted USB drive, the installation went as expected. I selected the free space for the installation, and followed the installation directions. I won’t cover those here, but the installation is just like any other modern Windows equivalent. You can always perform an upgrade installation, but then of course if you run into issues your only recourse would be to perform a factory restore. By dual-booting, you retain access to your official Windows 8.1 installation and a fully functional Surface Pro 3, while also being able to gain access to Windows 10. Let me know if you have any questions about the process, how it works for you. thank you for your instructions, worked nicely… I also tried to boot into a VHD, but the normal trick to use SHIFT+F10 to get a CMD prompt (for DISKPART) did not work. Off-hand I haven’t seen that, but if I get a chance I’ll look into it. I got the surface pro 3 to boot to a usb drive, the keyboard worked to select the drive (1) and not (c) continue, but after starting the windows on the usb, the keyboard/mouse did not work. i assume this is because the special drivers for the surface to run the mouse/keyboard were not present on the usb? can this be done via a usb hub so ordinary mouse/keyboard can be used? After successfully dual booting the SP3, am I able to DELETE -partitioned Win10 and UNSHRINK (the drive used) then RESTORE it to win8.1 using factory reset (not with the usb recovery way provided by MS). And Will I still have the same win8.1 Pro activated version using USB Recovery image that MS is providing? What are the odds? Thanks. Sorry, not exactly sure what you’re doing here. But, bottom line for me has been that once I went to Windows 10, I needed to do a complete restore using the USB Recovery image (and blowing away the existing partitions) to return completely to the factory default Windows 8.X install. Can a recovery image be created in a separate partition again if its been deleted/wiped in hard drive? Do i have to rely on usb recovery stick forever once it’s been removed? I don’t want to keep a usb recovery stick. I want the same old way where the recovery image is within the drive and accessible. One problem I have with my surface pro 3 and windows 8.1 is the display high DPI scaling. Where many applications (even microsoft default apps) are really blurry and look really bad. Does windows 10 fix these? I know that Build 10074 is supposed to offer improved HiDPI support, but I couldn’t point out where it’s significantly better than in Windows 8.1. Maybe I’m just not looking in the right place. Overall, I’m finding it to still be a bit hit and miss–some apps look great, some not nearly so good. I’m hopeful that Microsoft will get this ironed out eventually and they’ll approach what Apple has done, if not ever quite as good (that’s something Apple has always been good at, from the original Macintosh on). I don’t have any hope whatsoever for Win32 apps, but would love to be pleasantly surprised one day.